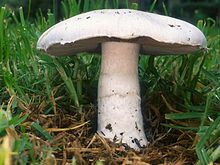 Agaricus campestris is commonly kent as the field mushruim or, in North Americae, meadow mushruim. It is a widely eaten gilled mushroom closely related tae the cultivatit button mushroom Agaricus bisporus. This page wis last eeditit on 20 Juin 2014, at 13:40.